One year, during the kuchi-kiri season, Rikyu was invited for tea by a certain teaist who professed to be a ‘wabi chajin’. Accompanying Rikyu was his son-in-law, Mozuya Sōan. When they entered the roji they found an impressive, old gate. As Sōan was admiring the gate he commented: “So splendid the way in which this gate evokes the beauty of sabi.” To this Rikyu replied: “People like me don’t pretend that this gate is an example of ‘sabi’. This is simply a very fine hanging gate. It’s obviously the result of much consideration and has likely been commissioned from a temple faraway in the hills, then transported here after much effort. The cost for building and transporting this gate would have been considerably high. If one really wanted to make a sabi-style gate, one would visit the craftsperson and ask for a shabby partition. 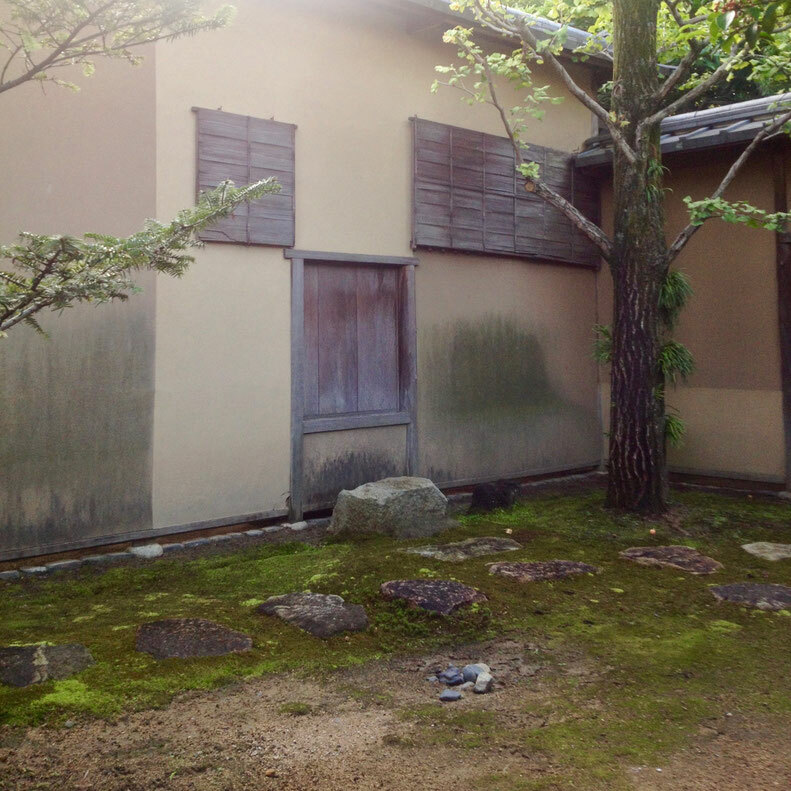 The craftsperson could then select some pine and cedar from offcuts to put together something rough and ready.” Such a flimsy gate fixed in the roji could well evoke the beauty of ‘sabi’. Even in passing observations the skill and attitudes of of the tea person are revealed. People that want to show off their understanding of wabi and sabi do not achieve wabi nor sabi. Wabi is evident in the sincere expression of the heart of the host. There’s no ‘sabi’ in a costly gate commissioned from afar. This is simply luxury under the guise of sabi. A tea person who goes to great expense to buy the spirit of sabi may fool their guests, but they also fool themselves. Such self-deception doesn’t amount chanoyu, nor anything of significance for that matter. This story has been going around and around in my head, I've been thinking al lot about this, in an attempt to gain further understanding of sabi. What came to me is that sabi is the foot prints of Tao. When an item has aged beautifully through genuine use, the evidence of that age is evidence of the Tao. When rocks have been carved by the wind and rain the wear visible on the rocks illuminate what is no longer there, and that beauty, that missing, is evidence of the Tao. The tea person who has practiced enough to truly know, not through any affectation or because Rikyu said, that a gate simply fashioned from remnants is perfect in itself, the Tao flows through that chajin's heart. The resulting beauty is sabi. I reckon that's a pretty good way to express something as elusive as sabi. There's desolation in sabi. Very simplistically, one might say that sabi is the colder, more unforgiving side of the ultimate. Whereas wabi is the warmer side of the cosmic order. Both are as unforgiving as they are sustaining.